Previously featured on MTV and VH1, Dr. Ayman Hakki is a nationally recognized cosmetic surgeon. MTV's award-winning "True Life" documentary series featured Dr. Hakki in action. Upon arriving at our Waldorf, Maryland location, you will step into a serene environment. Our boutique is designed to help you relax. Let us cater to your every need in a setting that evokes a sense of unparalleled glamour. Our state certified surgery center is built with a customized apres-surgery pampering center and is for the exclusive use of surgery patients. Our Luxxery Express office is located in Washington, DC is in the heart of Georgetown and the first DC area BOTOX Cosmetic Boutique. It serves as a place for Dr. Hakki to provide a speedy and convenient cosmetic Injectable services such as BOTOX Cosmetic, JUVEDERM?, Radiesse and other non-invasive treatment on a walk-in, no appointment needed basis while also serving as our location for cosmetic surgery consultations. 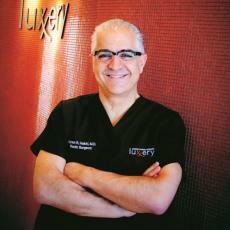 Dr. Ayman Hakki serves as founder and CEO of Luxxery Medical Boutiques. Board certified in plastic surgery, he has an accomplished and successful record and holds every service provided at the beauty boutiques to the highest standard. He performs all surgical procedures with a very active cosmetic surgery schedule focusing on fat grafting to the breast, face and buttocks. Dr. Hakki brings thirty years of experience in the cosmetic surgery field to his state-of-the-art facility in Waldorf, Maryland, complete with a state certified surgery suite and an apres-surgery pampering center.